IT'S the Gold Coast's answer to New York's Guggenheim and it's expected to bring an extra 500,000 tourists to the city a year. Sunland Group (ASX:SDG) has also revealed its proposed redevelopment of the ageing Mariner's Cove complex will inject new life into the city's tourism offering through ultra-modern fit-outs for the planned five-star hotel and a unique new retail and dining precinct. Sunland has named the $600 million development The Mariner, which the company says could lay the groundwork for the Gold Coast's evolution as a world city. It also builds on foundations laid by Sunland founder and chairman Soheil Abedian and managing director Sahba Abedian to bring a 'cultural shift' to the Gold Coast as it matures beyond its tourism potential. "In the years to come the arts will play a critical role in the emergence of the Gold Coast as a world-class city," says Sahba Abedian. "As individuals, as institutions, as members of the community the Gold Coast must take into consideration the influence of arts and architecture in shaping environments. "There is no doubt that this particular project can play a very unique and critical role in shaping the Gold Coast's future. "It really speaks to the cultural dimension of the city, something that Soheil and I have been very passionate about and have spoken extensively about over the course of the past five years. "As such we've incorporated a gallery museum space that will rival spaces that are internationally acclaimed, such as the Guggenheim in New York." 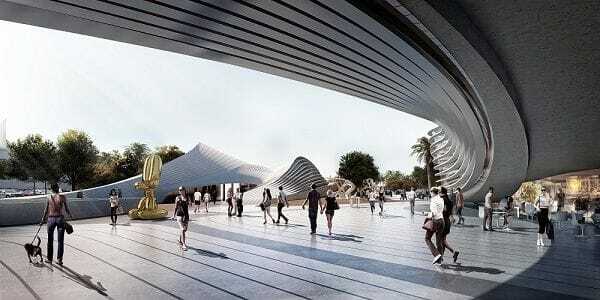 Sunland this week revealed more details of its proposal, which brings together an eclectic mix of spaces designed in collaboration with Pritzker Architecture Prize winner Dame Zaha Hadid. Her body of work includes Guangzhou Opera House, the London Aquatics Centre, Hong Kong's Jockey Club Innovation Tower and Milan's CityLife development. Hadid's vision for the Gold Coast incorporates a major aquarium comprising three separate tanks with species from three oceans, a 1000-seat convention centre, a five-star hotel, a retail and dining precinct, large open public spaces through a floating park and the science and arts museum which is located under a sculptured roof. 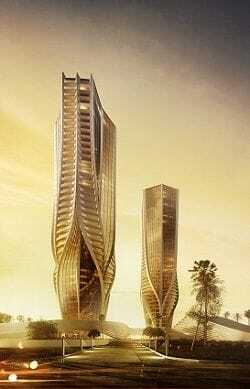 Sahba Abedian says the aim is to create 'unique spaces for the benefit of the community' while redefining the form of the towers to be two pieces of sculpture in their own right. "The complexity in the design I don't feel has been constructed anywhere else in the world. It will redefine the built form, not only in Australia but internationally." The Mariner, which has yet to receive council approval, is being underwritten the Sunland Foundation, Sunland Group's charitable fund with a philosophy of 'relieving ills and changing for the better'. Soheil Abedian believes The Mariner will create the same vibe for the city's tourism market that the Guggenheim has for New York and MONA has for Hobart. "The effect is one single building that is the centre of art resonating with the heart of the people and creating a dimension that is the legacy for future generations," he says. "What we are trying to do after 30-odd years in this city is to leave something behind for the better. "Everybody knows that museums don't really pay for themselves, but Sunland has taken the step with the Sunland Foundation to underwrite this project." With the Gold Coast poised to double its population to more than 1.2 million over the next two decades, Abedian says it is primed for a project of this caliber. "Sometimes we feel that we are a small fishing village that we used to be but this city has everything that major cities around the world aspire to have," he says. Local federal MP and newly appointed Minister for Human Resources and Veteran Affairs, Stuart Robert, says The Mariner will help bolster the Gold Coast's current visitation rate of one million a month. "These types of developments bring more, they act like a magnet in terms of the city's design, its allure and its international appeal," he says. "There are only seven museums of modern art in the country. The idea that we can cement a soul for the Gold Coast which is what art brings the city to life is a pretty exciting part of this development."